Bribing, ahem, I mean rewarding your child still works so don’t forget to use this. A lot of toddlers respond to positive reinforcement and rewards. Just make sure you reward for good behavior and not bad ones though. How does a hostage negotiator usually diffuse a tense situation? Keeping your cool and speaking calmly can help diffuse a major tantrum situation. Look them in the eye and calmly talk with them to find out what is bothering them. Set an example for your kid and calmly talk the situation through. Again, exercise patience and try to get your child to communicate with you. Want to maintain a sense of sanity to a very public meltdown of your child? Having a sense of humor can also do the trick in diffusing a meltdown situation. Try being silly with your child. That kind of distraction can direct his attention on you and can possibly bust that tantrum. Try to get your child to giggle and see how this can change the whole dynamics of the situation. Here’s another way of distracting your child and getting his or her attention into something else … Just leaving the scene of a meltdown can divert a child’s attention. It’s also very easy to do. The next time you feel the urge to spank your little one as a result of a tantrum going out of control, remind yourself to first stop and give it some thought. Don’t make a fuss out of it and model calm behavior. Spanking is not a smart way to deal with a child having a tantrum. Spanking only reinforces with your kid that using physical force is okay cause their parents are doing it. It teaches the child to be afraid of his or her parents. It teaches the child that his or her parents will hurt them to keep them in line. Instead, try using any of the above 10 ways to help pacify your child. These are better solutions that will positively impact your child in the long-term. In fact, here are 8 important reasons why you should not spank your child. You can read more details about this well researched article by Shaun Dreisbach about how to deal with a child’s tantrums on parents.com. 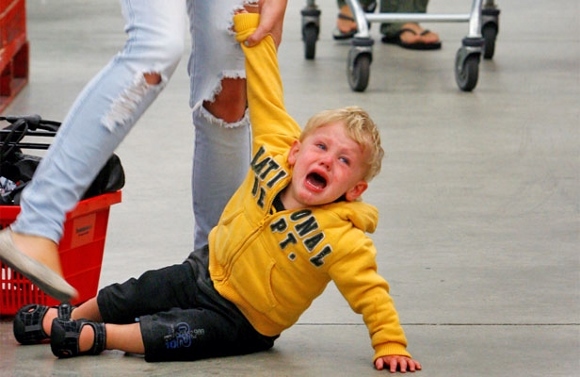 Do you have other smart ways of dealing with a child’s tantrum?